Hello, new orders coming. First from Idaho state and second from Utah and next one from Arizona. Thank you very much. Hello, today I found this good information that some users already adopted our capper to other guns. I asked for some detailed pictures so anyone can do the same with current PCA model if needed. We will produce PCC with this modification in few months when we will sell out our stock with current PCA / Remington 1858 model/. Hello , thank you for new orders from California, Arkansas. Here is new updated map of our Customer in US. First place California second Texas so far and there are still some states that nobody order yet. Some of you ordering two cappers so nice, we are so glad that you like our product. We continue our add in Cowboy Chronicle for next quarter, thank you. Hello, next orders coming from New Zealand, France, Germany and Washington state USA. Thanks a lot. 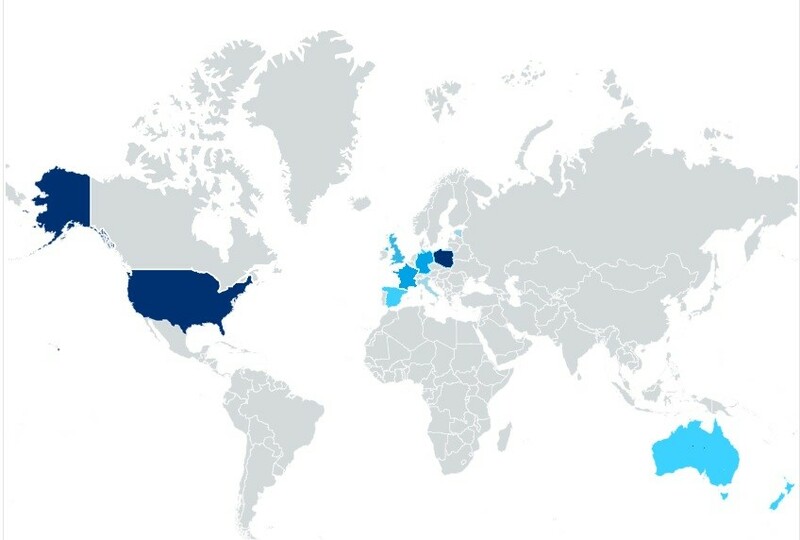 Here is global map of our Customers still a lot to cover ;). Not bad for just distributing out of a Post Office in Poland! You got a great product! Looking forward to using mine again in a match next weekend! I received mine and I am very impressed with the appearance and workmanship. I haven’t used it yet but I will. Hello we received next order from Pensylvania thanks a lot, your capper will be send today. Hello we just received first order from Minnesota thank you very much. Hello next order from Wisconsin, thanks a lot. Your capper will be send on Monday. I'm the feller from Wisconsin that ordered the capper. Thank you, I'm looking forward to trying it out! Hello, we just received next order from New York state, thank you very much. We are sending your capper today. Hello, new order from Florida just arrived, thank you very much. Thank you so much for current interest in our brand new capper. We promise to continue our production, hopefully this month we will have break even point with our profit/loss statements. It means first time we started to earn some money from this investment. This will help us to invest in new production hopefully next year /first quarter/ we will be able to run PCC series for Colt users. /Current PCA is dedicated to Remington New Army type of revolvers but you can easily adopt it also for any other revolvers like Colts or ROA's etc. Many people already did this with success. The whole adjustment is based on little filling down the loading head thickness just to be able to fit Colt's. 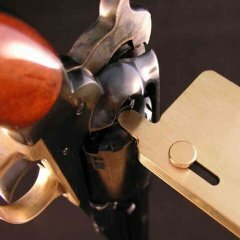 This capper is designed from the beginning to serve Remington New Army 1858 type of revolvers because as everyone know capping this specific revolver was a challenge. Now it is pice of cake even with gloves on your hand ;). Cheers and have a nice shooting using our unique capper. Some of you asking what is the price in USD: The price is fixed for 185PLN including delivery and this is converted to USD during your purchase. This conversion depends on current PLN/USD rate. This price is now around 50USD including delivery. PS. 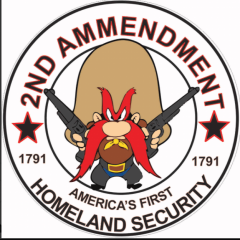 Forum www.1858remington.com is now working again, great news. Hello, we just received the order from Tasmania (Australia) , so nice. This is first order from Tasmania and 3rd from Australia so far. Thank you very much. We will send your capper today. It can takes up to 23 days of delivery for this distance. Merry Christmas! We wish all our present and future Clients all the best in this holy time. Take care of yourself and your family. Hello, new order from Idaho, thank you very much. We observe that our currency PLN (polish zloty) is now the strongest currency in the world. It is not good because our capper is getting more and more expensive in USD. Our price is fixed in PLN 185 including delivery world-wide. We started our shop in march 2017 when 1USD=4.25PLN now it is 1USD=3.42PLN around. It means our capper in USD cost approximately 53USD incl. delivery using current rate. We can't influence this so this increase c.a. 8USD is pure to the rate PLN/USD. We hope your currency will be stronger and it will be better for you. On the other hand we hope you can still afford it. We wish you all the best and Happy New Year 2018!!! All the best in New Year 2018!. PS. December was busy time for the post offices around the globe. Therefore maybe the delivery time could be little longer. Normally it takes from 7 to 23 days and depends on your local post efficiency. Our post office usually send it abroad in 3 days then your local post take it over for you. If you have any issue with long delivery time and you start to worry please let us know we always send you then the tracking number so you can check in your local post office what happened. Good news is that up to now we have 100% delivered cappers, no single disappearance or problem with delivery. Hello, we just received next order from Missouri, thank you very much. We will send your capper tomorrow. We saw in the News that there is strong winter now in US. Please stay warm and take care of you and your family. Hopefully everything will be ok.
Hello , just received next order from Indiana, thank you very much. When they get the Colt Capper available I will place a order for mine . Dear "Brett Black" this is excellent question. 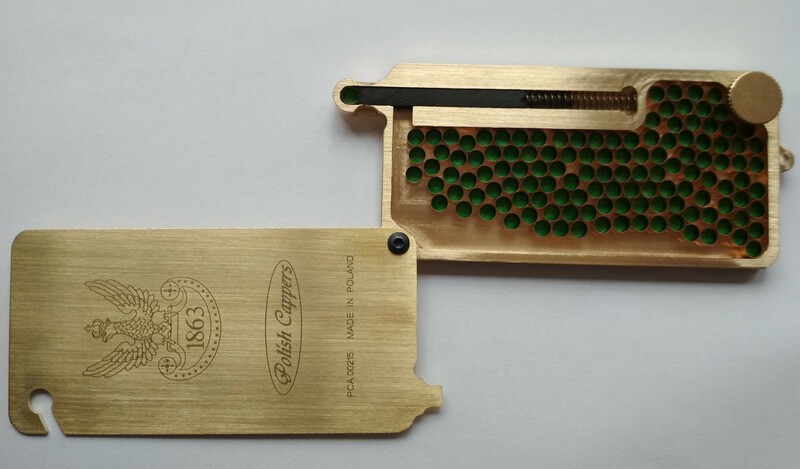 As we announced few months ago we will start PCC series of our capper as soon as we will reduce our stock of current PCA version. We produced originally 300 units of PCA capper and since march 2017 we sold over 240 units over the world. We still have c.a. 60 units on stock. Good news is that we are now on positive P&L so we started to earn money and we covered initial investment. We need to sell more PCA (around 40-50 units more) to start PCC version for Colt users. This is pure business decision. So all depends how fast we will sell that 50 more units of current PCA version. It could be month or few. I personally think we will start PCC end of march 2018, all depends on our Customers and the speed of sales PCA model. I would like to thank all Remington New Army Users who bought our PCA model so far. We have 100% positive comments up to now. 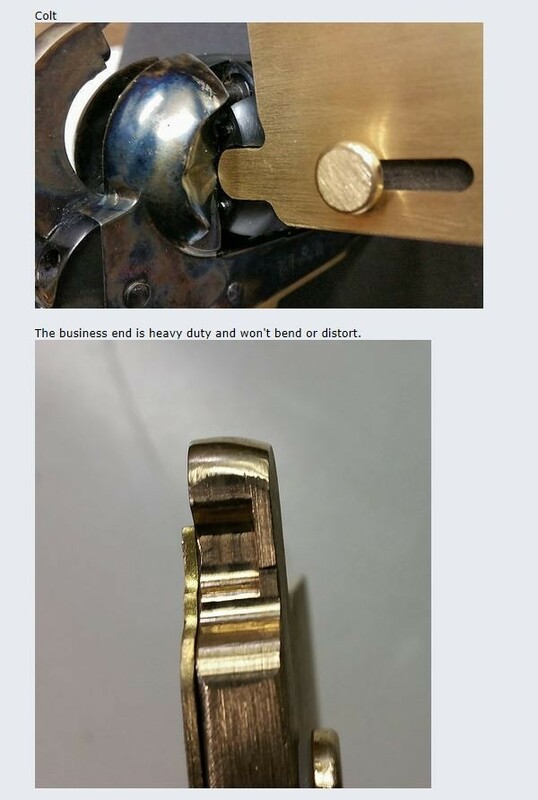 This proof quality of our product. Hello, next order from New Zealand just arrived, thank you very much we have already 4 Customers there ;). Hello , next order from Arizona US just arrived, thank you very much. Your capper will be send today. Hello, next order from Pennsylvania and few from UK and France meantime. Thank you. Hello, First order from Nevada finally arrived, great and thanks a lot. You are first person from Nevada. We will send you your capper on Monday. There are 40 units of PCA to sell now before we will start new series PCC. Hello, I would like to thank you for next order from Washington. I would like to show to new Customers how our capper is made so they can see it in details. You can see here the front cover. 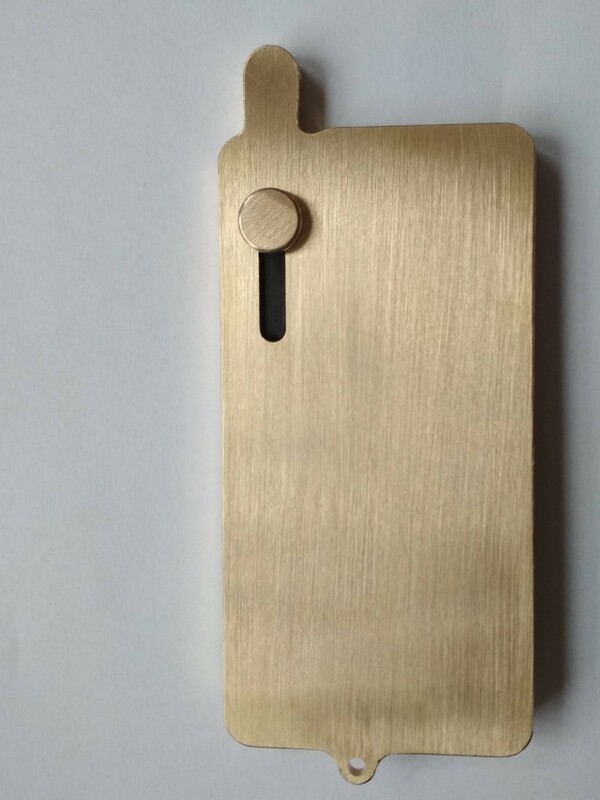 Body is made of high quality polished brass. There is at each universal capper engraved the image of the White Eagle from the time of the January Uprising in 1863 and a unique serial number and the inscription MADE IN POLAND. Here is the picture of rear side with the nice cocking lever to load percussion cap to loading head of this capper. Here is the view of the inside compartment and the mechanism. 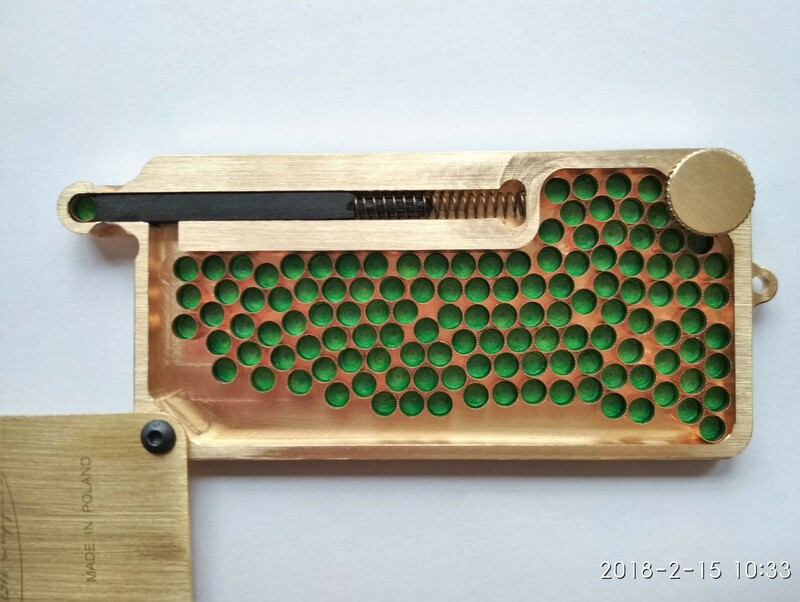 As you can see all is made by milling the solid brass. We use fully automatic 3D industry size milling machines. It allows us to produce with super accuracy and each capper is the same. The quality is awesome. You can now understand why it is not so cheap, this is not just sheet of brass and punched on the press. This is solid construction made from solid brass. The lid has c.a. 1mm thickness and the body is solid too. Here you can see this capper and c.a. 150 caps inside. The maximum capacity is 170 caps but to operate correctly we recommend max 150. You can mix all types of caps i.e. Remington 10 and RWS 1075 and others. There is no way that caps will fall over inside the capper. We know it is not cheap but it is worth every dollar you pay for it. The price is constant in PLN /Polish Zloty/ 185PLN including delivery everywhere around the globe. When we started our shop http://www.polishcappers.com in Feb 2017 it cost c.a. 44 USD now the cost is 54USD because the exchange rate PLN/USD. Thank you so much for your nice feedback, we have 100% satisfied Customers from USA and many other countries. Today we received next order from Connecticut, thank you. One year passed since we started our production of PCA and PCB series /PCB was short run 50 units/. We believe still we are not visible enough for our future Customers. So if you own our capper and you are our happy Customer please share this as much as you can with your Friends. We are selling through people network our Customers and some forums only we do not sell through many shops around the globe. 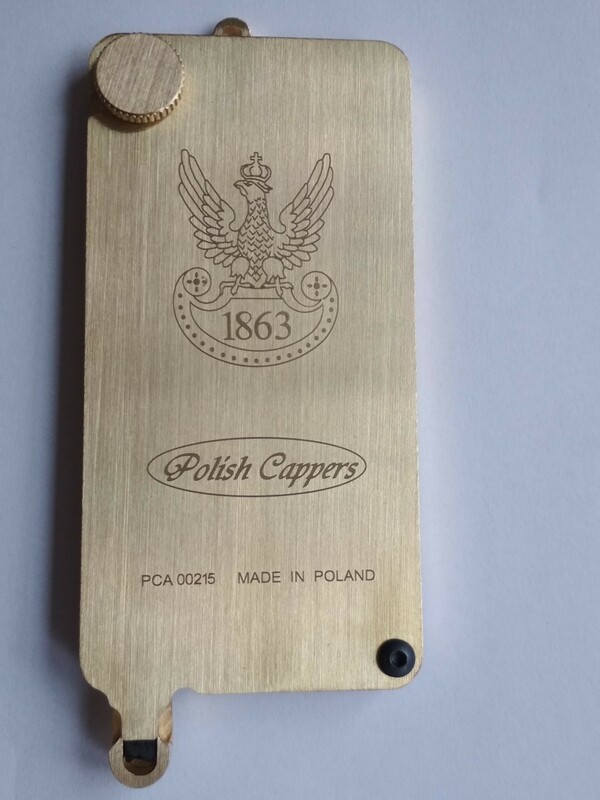 We have many requests for cooperation but we decided that in order to have full control over the quality we will sell only through our shop http://www.polishcappers.com . Only there you can buy Polish Capper. We will continue this mode until we can do it as today. If there will be enormous demand some day in the future we will consider other channels of distribution but this is not the case today. There are days that we are selling 6 units but most usual situation is 1 or 2 cappers per day. Sometimes there are few days without any order so our business is still very tiny and needs more visibility. When we will go level up then maybe there will be a chance to have lower price than today, everything depends on the scale of production and sell dynamics. We still need c.a. 35 PCA units to sell before we will start next gen production of the PCC series. If you have any feedback to us /especially from our current Customers/ let us know, please use our e-mail polishcappers@tlen.pl or use our contact form on our page http://www.polishcappers.com and write to us any your ideas, what we can change in our capper if you need any change, size and capacity, engravings any other hints? This is the time we can hear you and take into consideration any valid feedbacks before we will run next series. If we can ask you to give us a like on our Facebook page or share the information of our shop among your Friends we will be very grateful. This will speed up the whole process. Thank you for up to now support this allowed us to be on positive income now. We survived first year on the market so not bad and we are now on plus, so we are among 5% of start ups which survive first year of operation. This is promising for next year as well, everything depends on You our Customers. USA is our second largest market, of course Poland is the main one and we have some Customers in EU. 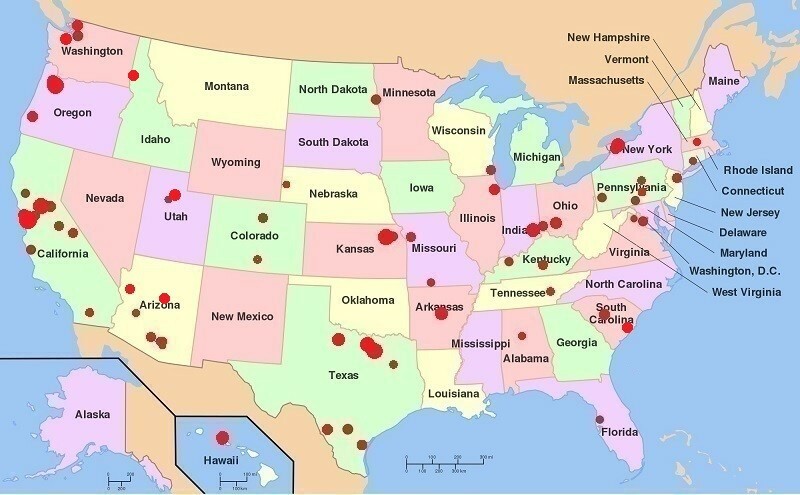 My dream is to spread our capper around the globe that nearly everyone who is black powder shooter at least will hear about us. You can help us of course to spread this information. Hello, next order from Pennsylvania, thank you. We sending your capper tomorrow. Hello, we have first year anniversary this month. This is good time /and as we promised/ to introduce next generation of our universal capper. The new PCC series is coming this month. It will operates with all revolvers in .36 .44 .45 caliber both Original and replicas made by Uberti, Pietta and other, pistols and rifles. PCC model is our answer for Colt users who asked us to upgrade our famous well known PCA model in order to operate with Colts, Rugers, Lemat and keep perfect Remington New Army capability as well. Please watch our YT channel there will be nice video with PCC model soon and we will open soon new post "2018 brand new Polish Capper model PCC"
Check our shop as well http://www.polishcappers.com. Our shop is the only place when you can buy our products. 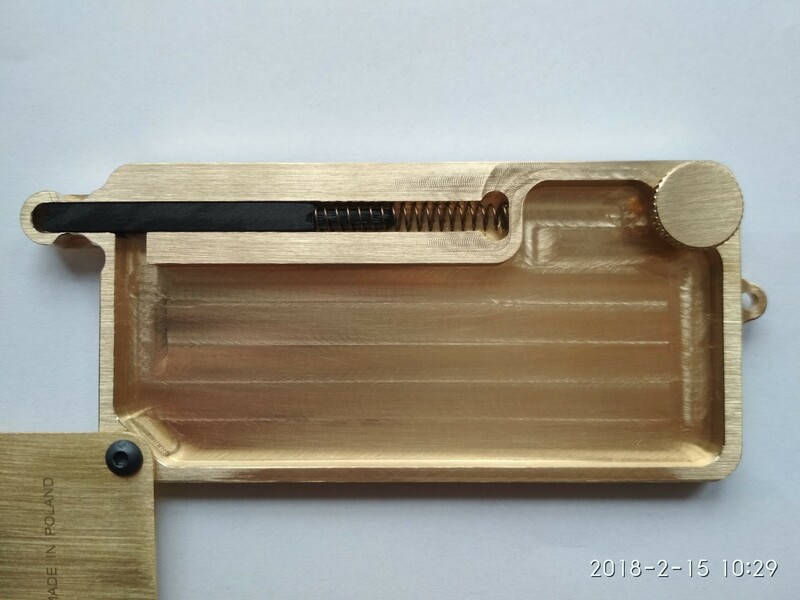 PCC model will have most advanced design of the loading head and the same time will keep all features of PCA, it’s size, capacity over 150 Capps of all types and the quality and reliability will be the same as PCA. The operation will remain the same as PCA. In our opinion this will be the best capper of all time. 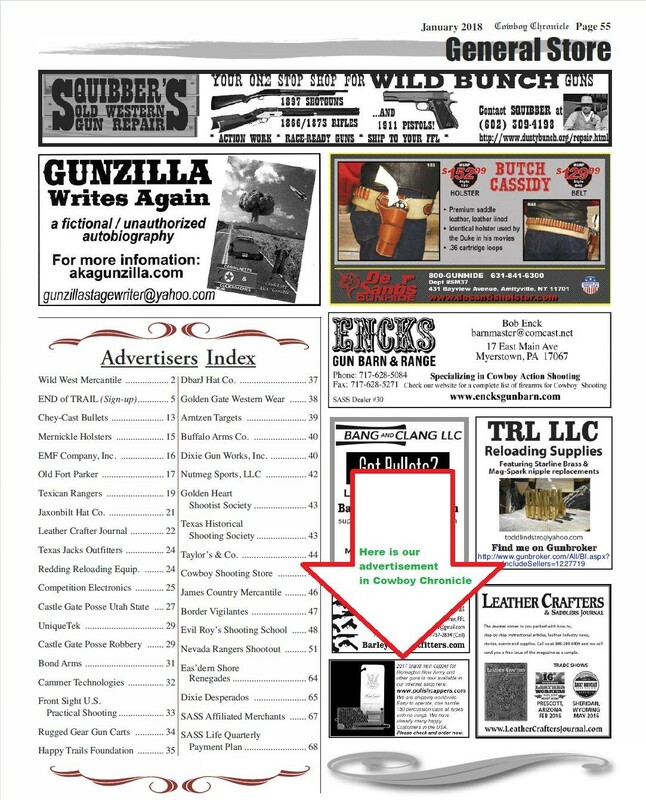 Please keep in mind that our PCA model for Remington New Army will be still available because we know this is the best capper for Remington New Army 1858 world-wide. Taking this opportunity we would like to thank our Customers for supporting us. We have hundreds of very positive feedbacks from Remington users. Please read our new post regarding 2018 PCC capper. There are few video for you as promised. Then after small modification PCA is transform to PCC model. We have confirmation that our new PCC model we will start to sell mid of April 2018 the earliest. We have still about 30 units of PCA capper on stock. This is good time to buy last units in that price. Next production will be slightly more expensive due to overall cost increase in labour and raw materials specially brass.